Scenery, wilderness and tranquility on the outskirts of Tours. On site you can enjoy fishing, canoeing, bird watching and especially kingfishers, have a drink on the sunny terrace, play on the sandbanks near the mill, you walk to municipal courts, minigolf or at the restaurant located at the entrance of the town of Monts. Children can have fun in the adjoining streams or build rafts and huts of the surrounding islands. Due insecure surroundings, we strongly discourage families with children under 5 years and / or can not swim. A 20 minute maximum drive: the castle of Azay le Rideau, the Ronsard: The St Cosme priory, home of Balzac in Saché, gardens & Villandry, the gardens of the Chatonnière Montbazon fortress with its medium-âgeuses animations, Castle Candé and its summer exhibitions, everything is at hand! End of stay included, wood included. Extra: electricity according to consumption, taxes. Bed linen / towels on the beds: 15 euros / person Because of the immediate proximity of the water and its unsecured surroundings, we do not recommend this cottage to families with young children and / or not knowing how to swim. We accept no liability for accidents with the river. What a perfect place to spend a week this place has everything. The Moulin itself is comfortable and well equipped but it's the outside areas that really make it special. A really beautiful location with water on every side, good fishing literally on your doorstep and some special wildlife. We spotted the Beavers most evenings, Deer in the garden, countless birds and one night a family of Wild Boar came down to the river. If you can drag yourself away from the Moulin there are so many places to go to in the area with just a short drive, chateaus around every corner some lovely villages and markets and the Musee Beaux Arts in Tours is well worth visiting. We will be back. One of Best Rentals Yet!!!!!!!!!!!!! Thank you for a wonderful rental. This place was by far one of the most comfortable, most conveniently located we have ever stayed at. The location is like something out of a story book. 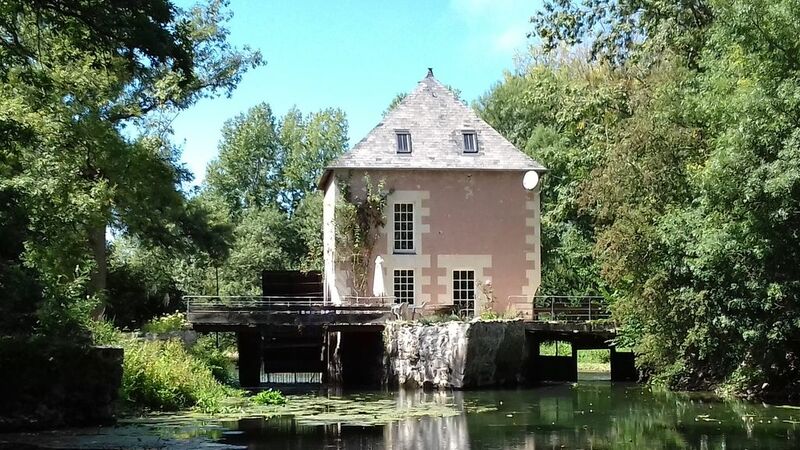 Located on the l'Indre River, we had absolute privacy in a quiet Mill House - it even had the original water wheel. The inside is renovated with all the modern conveniences built around the original gears and wheels. Clean and comfortable - couldn't be better. Close to the village of Monts with several fantastic restaurants - from pizza to gourmet french. Close to all of the Chateaus. If you like to hike, there are many trails in the surrounding area. If you like to fish, you can actually see the fish in the river water. An unbelievable place. Thank you so much for two weeks of utter bliss.